Everyone experiences feeling underestimated at least once in their lives. 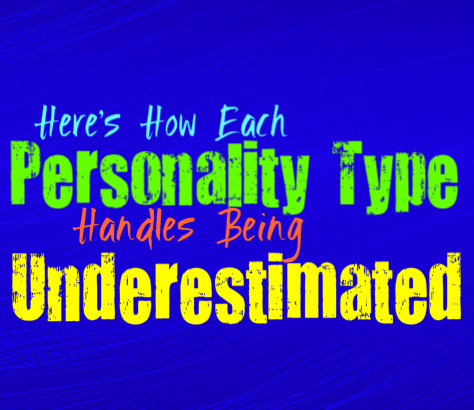 Here is how each personality type handles being underestimated. INFJs really don’t appreciate being underestimated, but this is something that happens often. Many people look past their intuitive abilities and assume they are less aware than they actually are. This is often because INFJs are often reserved people who don’t openly express themselves. It is easy for people who underestimate their intuition, their strength and their capacity for taking charge when it is needed. When the INFJ is underestimated they can take offense when it is their loved ones, but will certainly take advantage of it when it is outsiders. ENFJs can keep their very personal information private, and enjoy being able to connect with people without having to share too much. When someone underestimates them they can often take this as a challenge and will work to prove themselves. ENFJs want people to appreciate their skills and their abilities and will ensure that they are impressed. They are compassionate people, but they want to be viewed as valuable and capable by their loved ones. INFPs can often be underestimated by others, since they can keep to themselves often. Their sensitive and kind nature makes it difficult for people to see how capable they can be. INFPs aren’t ruled by their emotions as much as people think they are. INFPs simply process the facts and ultimate make a choice that is true to themselves and their morals. This makes them stronger than people realize, since they can often handle more emotional struggles than people who ignore their feelings. ENFPs react to being underestimated by pushing themselves to prove people wrong. They don’t enjoy when people look past them and their natural abilities, and will become a bit frustrated. They might not show this emotion outwardly, but they will prove others just how strong-willed and intelligent they actually are. ENFPs will take on being underestimated as a challenge, and will work hard to improve and showcase their real skills. INTJs respond to being underestimated depending entirely upon who is underestimating them. INTJs can become upset when their loved ones do not trust their skills and their abilities, and will want to prove them wrong. This can hurt their relationship though, since the INTJ wants people in their lives who value them and believe in them. When someone in the workplace undervalues them it can be frustrating as well and they will find a way to prove them completely wrong. Where INTJs don’t mind feeling underestimated is when it comes to their competition, since this gives them a chance to surprise people. ENTJs can become angry when people underestimate them, and want to be respected for their abilities. They will take on this challenge and will find ways to showcase their real skills. ENTJs are hardworking people who are not afraid of a challenge, but they want people to see just how capable they are. They will find ways to prove to others just how strong and intelligent they are. When their loved ones underestimate them the ENTJ can be rather upset, and will want to find ways to prove to them how wrong they are. INTPs don’t mind feeling underestimated by strangers, and are often used to this. They are intuitive and internal people, which makes it easy for their logic to go well above others heads. Their abilities often go unrecognized until well after others have started to realize just how right they were. INTPs don’t mind when people underestimate them because it often gives them the privacy to handle their own business without having people invading their privacy. When their loved ones underestimate them it can really hurt the INTP, they want people around them who trust and believe in them. ENTPs are adventurous people who truly enjoy taking on a challenge. When people underestimate them it gives them more incentive just to prove them wrong. They don’t mind having to show people how capable and intelligent they are, it is surprisingly thrilling for the ENTP to make this effort. When someone underestimates the ENTP they will push in order to show them how capable they are, and will feel like they have accomplished something when they prove others wrong. ISTJs don’t particularly like being underestimated, especially since they are so hardworking. When people don’t trust in their abilities the ISTJ will try hard to prove them wrong. They will continue to push themselves to work hard and show those around them how capable they are. ISTJs want to be able to make their loved ones proud, and don’t like when those people do not trust them and their abilities. ESTJs are hardworking people who certainly do not like being underestimated. They will work hard to improve and show those around them just how capable they are. ESTJs become frustrated when they aren’t trusted in their work environment, and will take on this challenge in order to prove their abilities. ESTJs simply want others to trust their strengths, and want to be sure that they maintain a sense of respect and reliability. ISFJs don’t often take notice when people underestimate them, since they prefer to focus on what they can do to take care of others. ISFJs are capable of proving people wrong, especially since they are always pushing themselves to be better. They don’t enjoy when their loved ones lack faith and trust in them though, and will become hurt by this. ISFJs don’t want to have to constantly prove themselves, especially since they already do so much for others. ESFJs often don’t mind when strangers underestimate them, and might take this as a challenge to prove them wrong down the line. They don’t really want people knowing their business, so this sort of thing isn’t a big deal for the ESFJ. They want to be able to focus on taking care of their loved ones, since that is what truly matters to them. When someone close to the ESFJ underestimates them, this can truly hurt their feelings. They want the people they love to believe in them, especially since they do so much for those people. ISTPs don’t really care when strangers underestimate them, and might even take that as a good thing. When people underestimate them it gives them more freedom and more of an opportunity to do what they please without expectations. ISTPs don’t expect everyone to understand how capable and intelligent they are, and don’t believe it is their place to control that. They do want their loved ones to believe in them though, and might become a bit frustrated if they do not. When ESTPs are underestimated they often take this as a challenge to prove others wrong. They can be somewhat argumentative and competitive people, who enjoy proving themselves. ESTPs often get a rush out of being able to showcase their skills to others, and don’t mind having to work a little harder for this. They want to be seen as impressive and will utilize an opportunity to make others see their abilities. ISFPs don’t enjoy being underestimated, but this happens often. They can be easily viewed as emotional and flighty people, while others overlook their deeper and more complicated skills. ISFPs don’t expect others to always see them clearly, they just want their loved ones to understand them. ISFPs care about the people close to them and want those individuals to trust them and believe in them. ESFPs don’t enjoy being underestimated and can actually take this as a challenge. They want others to believe in them and their abilities, and will work hard to be impressive. While ESFPs are spontaneous and fun loving people, they don’t want to be underestimated. ESFPs especially want their loved ones to believe in them and see them as capable people. Follow her on Facebook or on Twitter.